Perhaps the most popular trend in contemporary Islamic legal and political thought is to view shari’a as embodied not primarily in specific rules or thorough extraction of those rules from the revelatory texts according to the methods of classical legal theory (usul al-fiqh), but rather as defined in terms of the overall ‘purposes’ (maqasid) for which Allah swt revealed the law, this is known as ‘the theory of the purposes of divine law’ (Maqasid Al-shari’a). One of the leading classical scholars who developed this notion was Imam Abu Ishaq al-Shatibi, an Andalusian scholar who lived 1388 AD. Scholars over the years and to this day, have differed over as to what constitutes a maqasid (an objective), how many, and how it is identified and whether textual or not. Al-Shatibi’s arguement was that maqasid’s are known from clear injunctions, but can they also be known from a general reading of the nusus by way of induction? And determining what is beneficial and harmful cannot be left to human reasoning alone (as most western theorists advocate, as in the social contract theory and the normative stakeholder theory). For some reformers and pragmatists who want to establish Islamic legitimacy for new substantive moral, legal and political commitments in new socio-political conditions, this method allows Muslims to ask not whether a given norm has been expressly endorsed within the texts, but whether it is compatible with the deeper goods and interests which Allah wants to protect through the law. But in our encountering with modern liberal and secular thought and law, are we mis-using maqasid al-Shari`ah and the maslahah (public benefit) by thinking there is an induction and intent for everything, when it may not be the case or are we just accomodating Shari`ah for it to be more conformative to modern law? So what was Imam Shatibi proposing ? Have we mis-understood his work ? 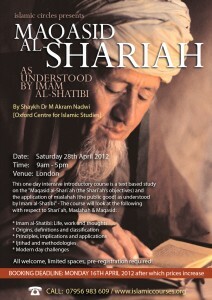 Shaykh Dr Muhammad Akram Nadwi studied and taught Shari’a at the Nadwatul ‘Ulama (India). A Muhaddith specialising in ‘Ilm al-Rijal (the study of the narrators of Hadith), Shaykh Akram has ijaza (licenses) from various mashayakh, including Abul Hasan Ali Al-Nadwi, Abdul-Fattah Abu Ghuddah and Yusuf al-Qaradawi. He has authored and translated many titles on Fiqh, Qur’an and Hadith including his monumental 40 volume work on Al-Muhaddithaat – The Lives of Female Scholars of Hadith. Shaykh Akram is a research fellow at the Oxford Centre for Islamic Studies, Oxford University.